I'll be the first to admit it: I didn't expect it to happen. But now, Microsoft has proven me wrong. The Xbox One is China's first official video game console in 14 years and, as of today, it is officially on sale. Originally slated for release last Tuesday, the console was delayed for six days. There was a launch party set up, but due to poor weather, the party was canceled. Microsoft also provided statements, saying that haven't been any new celebrations planned for the console's launch. Despite the lack of official plans, the Xbox One's launch wasn't without fanfare. 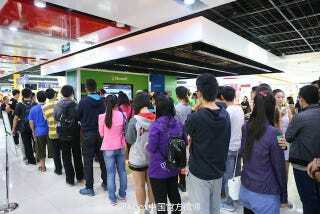 One of Microsoft's retail partners organised a midnight launch for eight of its retail outlets across China. Sure, it's not like a midnight release at a GameStop, but Sunning electronics had a store in Beijing, Shanghai, Shenzhen, Guangzhou, Nanjing, Shenyang, Wuhan, and Chongqing open at midnight. That's pretty much the major Chinese cities. The following video and photos are of the midnight launch in Shanghai. Just look at those photos of the Shanghai midnight launch! It doesn't look as bad as what happened in Japan. Then again, Japan's had gaming consoles since forever. Unfortunately, it appears most of photos of the launch were photos of the Beijing and Shanghai locations. Some of the photos were taken this morning, and not at the Midnight launch event. In Beijing, one of the Xbox launch partners even enlisted the help of Chinese professional gamer Cao Mei. A guy in an Xbox T-shirt plays a game with Professional League of Legends player Cao Mei at a Sunning electronics store in Beijing during the Xbox One Launch. So far, there haven't been many posts of the other six stores on Chinese social media. Gamers who purchased the Xbox One on launch day received special controllers in their boxes. The controllers have the words "China Day One" inscribed above the Xbox button. Microsoft hasn't said how many Xbox's in China sold will be considered a success, one can only wonder how much of a head start the Windows company really got being the first to launch a home console in China. Kotaku will have more on the Xbox's launch in China as the weeks go on.